HIMMEE lighting brand was founded in 2014 by a designer Timo Niskanen. HIMMEE represents fresh, young Nordic design. The design language of the collection is discreet and suits modern homes perfectly. Each lamp comes with its story and a piece of HIMMEE’s soul. Lamps are manufactured in Finland. People often find features of living creatures in the products. The same happened to Niskanen with Filly lamp. Niskanen was working with the prototype of the lamp and it started to look like a stick horse and he added small ears to the shade to tell this story. The interesting origami shape shade is made of bended aluminium. The attachment pieces for the stem are formed in the same process. The base part of the lamp is concrete cast in mould. The concrete part is left rough to give contrast to the finished oak and metal parts. Filly gives well focused light for reading and working. It also suits ambient lighting. The prototype of Filly Long Neck was shown at Milan Furniture Fair in 2011 and now it has its commercial premiere. Filly family consists of three lamps: two floor lamps and a table lamp. 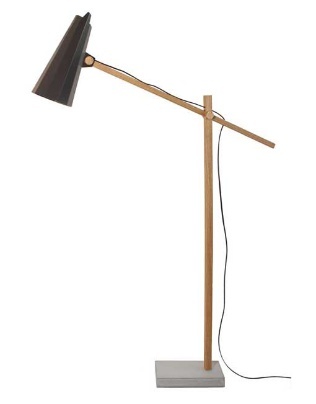 All the lamps have a concrete base, an oak stem and an aluminium shade. The colour of the shade comes in dark grey or white.